Discover some beautiful teenage girl room ideas. 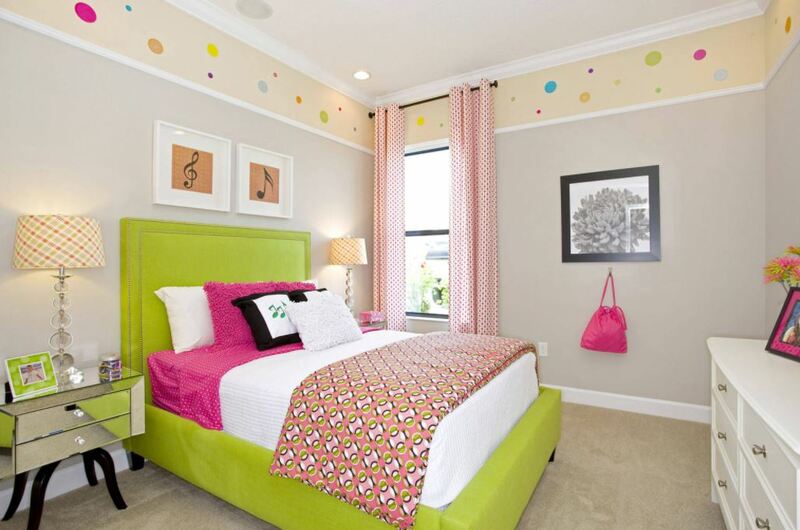 Girls love to add a personalized and playful touch to their room. Here are some wonderful ideas to decorate a teenage girl’s room. Have a look at them! This teenage girl room looks very feminine. The platform bed under the beautiful chandelier looks as if inviting the beautiful princess for a quiet and peaceful slumber. The soft color combinations of beige and various hues of brown extend a soothing effect to the room. The antique looking glass lamp shade looks stunning! This room has a nice cozy ambiance. It is properly illuminated and done using black and white color. 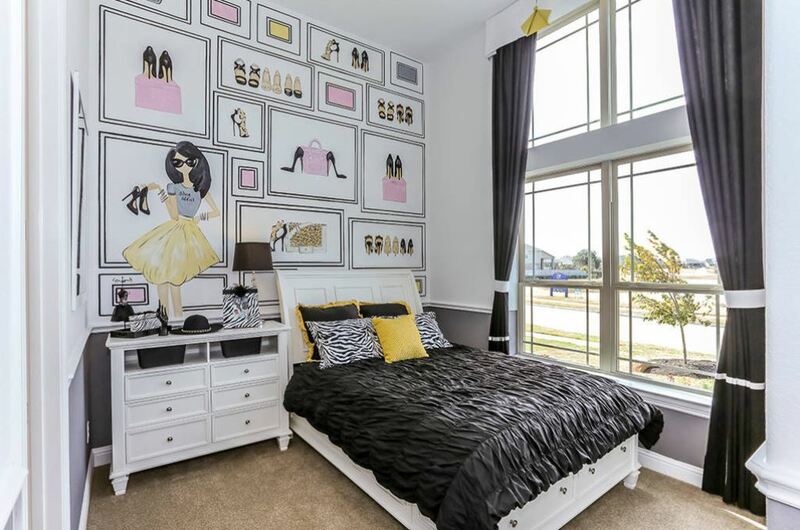 The huge framed mirror is a perfect addition to this girl’s room. Build-in wardrobes look elegant and offer lots of storage space. I love the decorative wrought iron headboard; it is quite eye-catching. The color blue is associated with calmness and depth and looks like this defines the personality of the occupant of this room. The natural insurgence of sunlight fills the room with positive vibes. The subtle color tones on the wall and the furniture makes it look very spacious. A slice of fairy land Indeed! 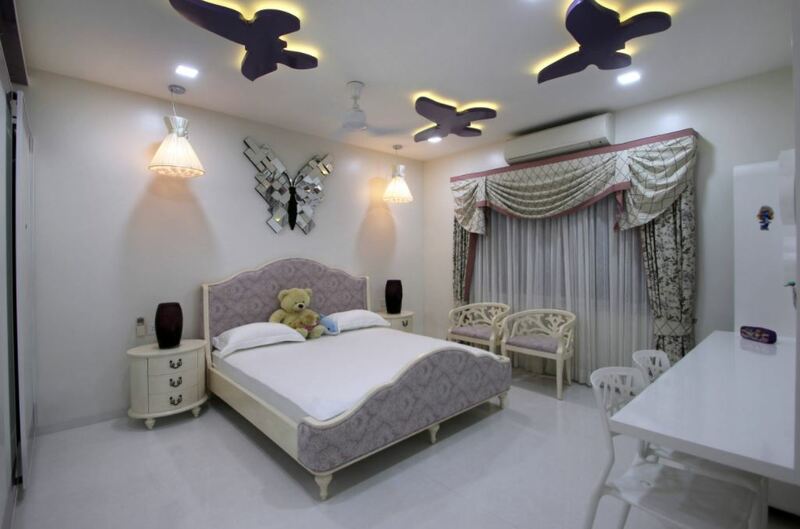 This is a white bedroom; white is symbolic of innocence and purity. Lacy upholstery and bedspreads are very attractive and they go well with the sheer curtain. The black and white artwork and the exquisite chandelier further define the elegance of this room. This teenage bedroom has a beautiful window treatment. The room also flaunts a lovely wall unit with multi-purpose niche created in it. This is a simple bedroom with straight line furniture and smart upholstery which totally complements the fabulous bedspreads. 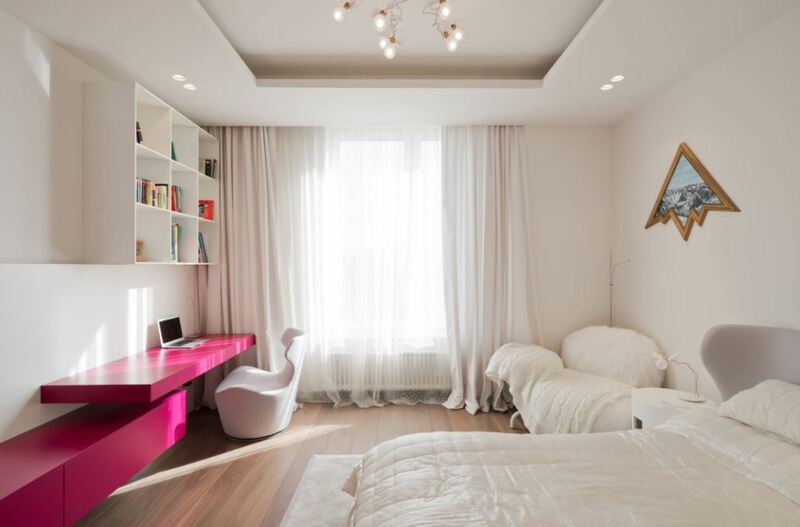 The splash of pink in this beautiful white bedroom is a pleasant and welcoming contrast. This room is sunlit and full of positivity. I really like the offbeat frame on the wall. The floating shelves and desk offer an ideal place to store books and study. This teenage girl room thus speaks of style and elegance. This is a chic teen bedroom rich in detail and texture. Look at the taste for the brands that is pleasantly flaunted on the walls. An idea with novelty indeed! The layout of the room is simple with straight lined furniture. Large white flat roman shade adds softness and black accents add interest. The light arrangement on the ceiling with the butterfly motif is an idea of novelty. Add beauty to the bedroom with a glistening butterfly mirror on the wall. The room is looking stately and smart. I love the bed and the oval-shaped night stands. 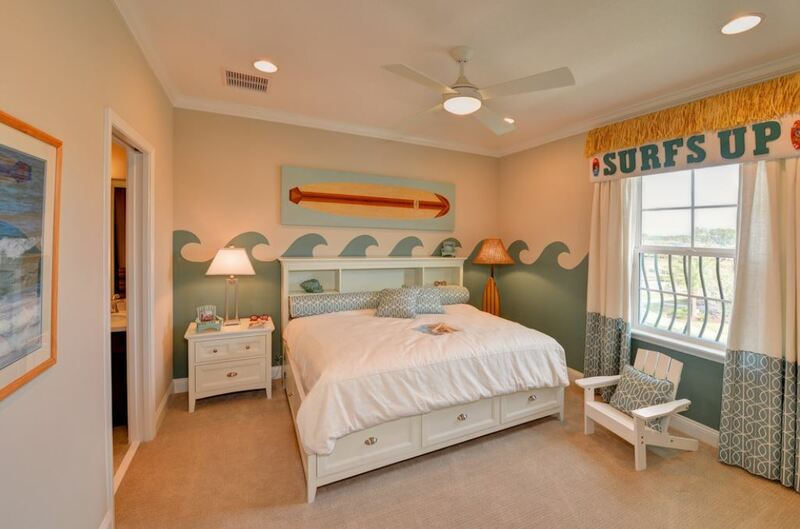 This girl’s bedroom has the surf theme; accentuate it by adding wave mural on the wall. The surf floor lamp and the custom drapes define the theme. Adding on to it is the picture on the wall. The straight lined white furniture gives a pristine look to the room. This teenage girl room has a wonderful color scheme. It is full of different types of patterns – stripes, geometric, curvy to name a few. A nice upholstered headboard is set against contemporary wallpaper. The ceiling of the room is slanted and looks quite unique. Look at this teenage bedroom which is a style statement in itself. It has a cute lively feel about it which is hard to miss. The choice of resplendent colors used with uniqueness makes it look creative and different. I love the polka dot border on top part of the wall. 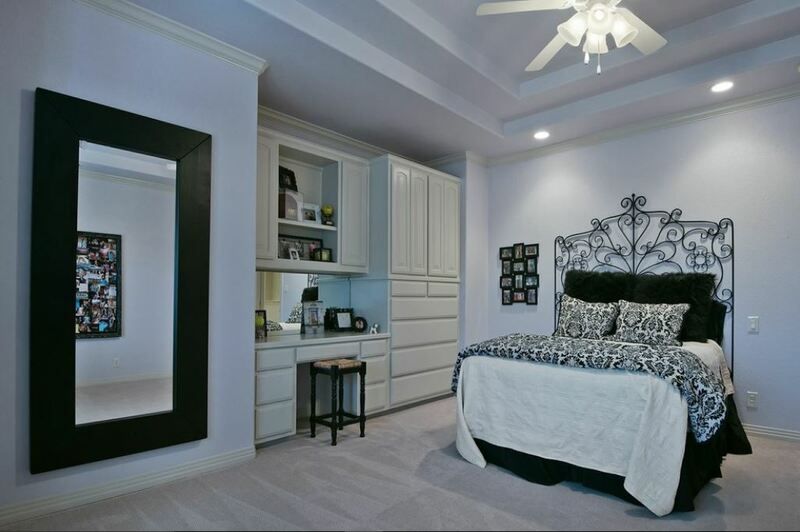 The first thing that will catch everyone’s eyes in this teenage girl room is the fabulous accent wall. Each and every element in here is defined in a wonderful way. I like the wallpaper and the bed, they are awesome. The window has a wonderful treatment. The size allows enough sunlight in the room highlighting the lovely decor. The accent wall is one of its kind; something which I had never seen before! The arrangement of the bed beside the huge window allows the princess to connect with the world outside. This is a small bedroom but is done up in a very smart way. The designer uses the space cleverly keeping the need of the occupant in mind. This teenage room flaunts of a unique paint pattern. The fading blue tone gives the effect of a ‘water world’. The chandelier, though simple, gives a majestic feel to the room. The use of the pink color tone in contrast with the shades of blue stands out! The purple wallpaper together with the furniture gives a nice likable quirkiness to this teenage girl room. 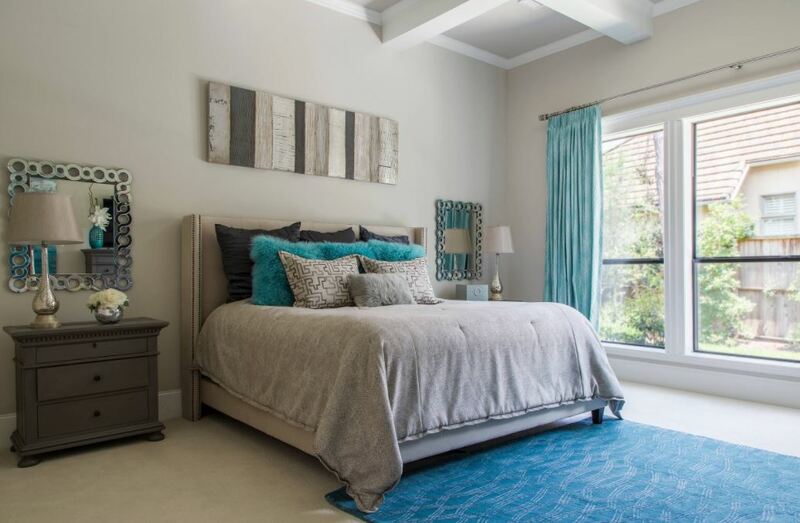 The bedroom is adorned with two bold shades put in perfect synchronization. It is very spacious and would make a fabulous place to spend nights with your friends. This entry was posted in Bedroom Designs, Kids Room, Kids Room Designs and tagged Girls Bedroom Designs, Girls Bedroom Ideas, Girly Bedroom Ideas for Small Rooms, Room Ideas for Teenage Girl, Teenage Bedroom, Teenage Bedroom Ideas for Small Rooms, Teenage Girl Bedroom, Teenage Girl Bedroom Ideas for Small Rooms, Teenage Girl Room, Teenage Girl Room Decor, Teenage Girl Room Ideas, Teenage Girls Bedroom Designs, Teenage Girls Bedroom Ideas, Teenage Girls Bedrooms, Teenage Room by Preeti Sinha. Bookmark the permalink.